On International Day of the Forest, my husband and I wanted to undertake a forest walk with a dear friend in so-called “Paradise”, where we could walk around a healthy forest of fully grown trees. This trip became for me a journey “from paradise into hell”. 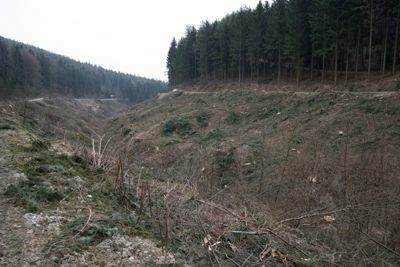 This idyllic forest section had just been destroyed by being completely cleared. 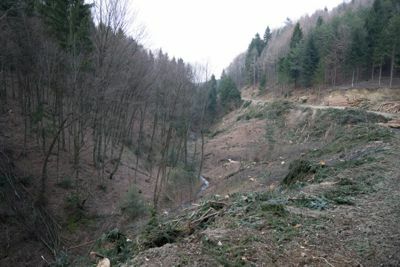 The large centuries-old tree trunks were already stored on a path which likened a motorway, ready for the logging trucks to take them away. Several smaller branches were piled up at the side of the path. 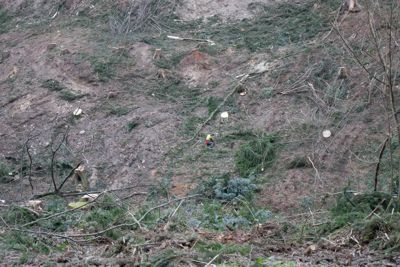 The felling machines were still standing around in order to complete their ‘work’. 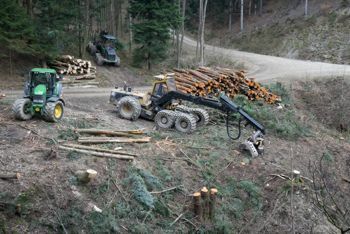 These machines fell trees quickly and efficiently, but traces and the damage they cause can be evidenced for a long time after on the forest floor. 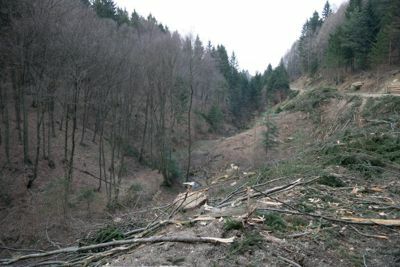 Why did this tree clearance affect me so badly? 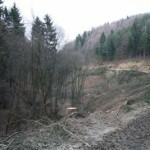 Yet again, a natural treasure had been destroyed! Yet again, a paradise had disappeared! What is now going to prevent the hang slides? Will the circular path be closed again? Will the forest animals dare to go down to drink from the stream again? Our parents and grandparents always looked after the forest and only undertook the clearance of trees with great caution. 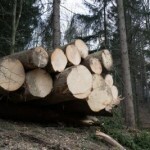 Today, is profit the only consideration of the forest owners? Last week on TV I saw reports of the drought-stricken orange trees in California as well as the wells which had to be dug ever deeper due to the receding ground water and the poor quality of the drinking water in many regions of the world. When will we wake up and realise? In the midst of all this destruction I saw a person with a high visibility jacket. 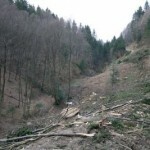 He had been charged with the task of re-forestation. 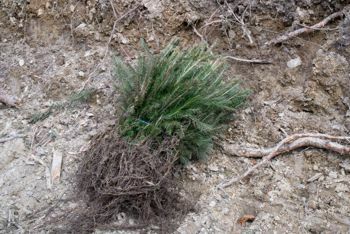 Five to six thousand young fir seedlings were to be planted in the coming weeks. 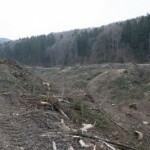 Normally, I would have been over the moon with joy at this great re-forestation effort but this time, I was still in a state of shock over the total destruction of the beautiful mature forest. In retrospect, I have to commend the Land Property Register of the neighbouring town for their immediate re-forestation efforts because our Land Property Register leaves this matter to nature! 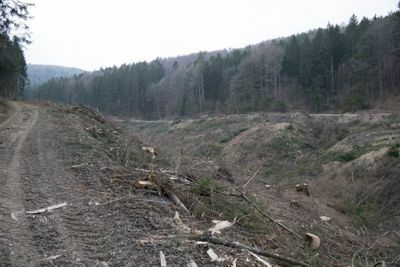 Our parents and grandparents had divided the forest into seventy sections so that only one of these sections would have to be cleared every year, that way ensuring that every generation had wood available. Our forebears always considered their children and grandchildren. But today? Excuses range from seed trees, natural growth and so on, so that no-one has to take on the onerous task of re-forestation! An anonymous article appeared in the local community newspaper, accusing one person of “befouling his own nest”. I immediately felt addressed! 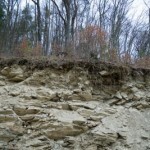 However, I consider myself to be a “nest protector” and only wish to protect and save our national treasure – our forests! To mark International Day of the Forest, our local community newspaper commended our forest because it consists of 3.4 billion trees. I simply cannot believe that! Some of these trees are also supposed to be older than 1000 years. How fortunate for these rare specimens! In addition, the article goes on to say that one fir tree produces 1000 litres of oxygen and that one tree needs around 100 years to reach full maturity. In addition, our forest is cited as being a major economic factor since each year wood is exported to the value of 3 billion Euros. Hotels and office buildings from England to Japan are constructed using our precious wood. I cannot share this euphoria but ask myself: Do other countries protect their forests? 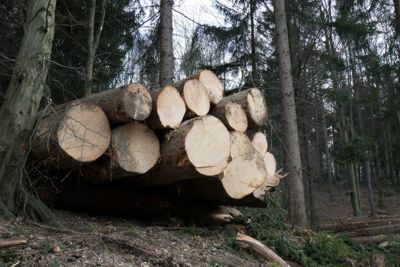 Are we wasting our precious forest resources? 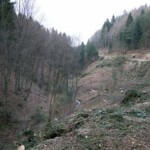 Is that the reason why we are currently clearing the forests, come hell or high water? Has the wood industry employed excellent marketing strategies using the arguments of employment opportunities and export possibilities? 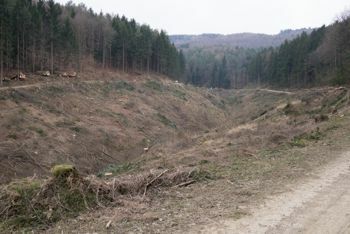 Do the relevant authorities not care about the destruction of our forests which provide vital habitats for animals and valuable recreational spaces for humans? Are my conclusions far-fetched? 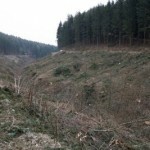 My goals: Formerly – Re-forestation! 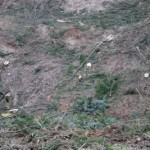 Today – intelligent clearing and re-forestation! Maintain healthy living spaces through future-oriented strategies and investment in nature protection, environmental and forest protection! Let us collectively act and inform!